These books by Piet Olyslager were printed in 1961, each book covers the following periods :- Book No. 1 1770-1901, No. 2 1901-1910, No. 3 1910-1922, No. 4 1922-1929, No. 5 1929-1932, No. 6 1932-37, No. 7 1937-1939, No. 8 1940-1948, No. 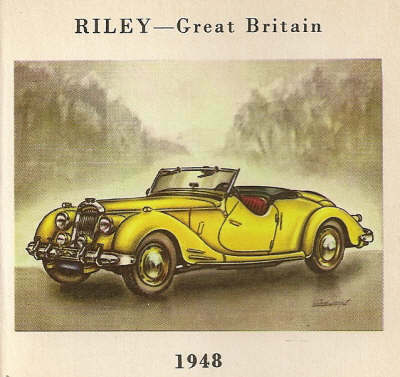 9 1948-1950, No. 10 1951-1952, No. 11 1953-1954, No. 12 1954-1955, No. 13 1955, No. 14 1955-1956, No. 15 1956, No. 16 1956, No. 17 1956, No. 18 1956, No. 19 1956, No. 20 1955-1957. They were published by the Sunday Times and Spar (a "corner shop" chain). 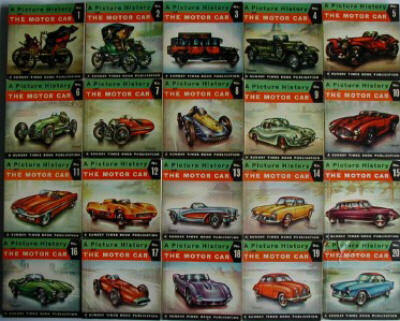 Each book is approx 9 x 9cm (3.5 x 3.5 in) printed on stiff card and contains approx 28 - 30 cars with a brief description. 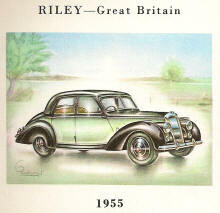 Rileys appear in several of them, see below. 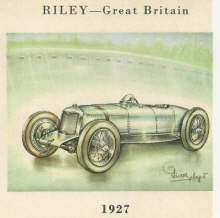 Type "Brooklands", 2-seater sports racing car. 4-cyl. o.h.v. engine in line. Bore and stroke 60x95 mm. Max. b.h.p. 50 at 5,000 r.p.m. 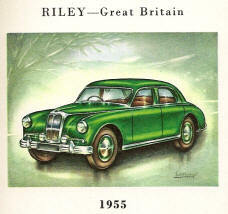 Type 2.5 litre, 3 seater sports Tourer. Type "Pathfinder", 4/5 pass. Saloon. 4,400 r.p.m. 4 speeds. Max speed 100 m.p.h. Type 1 1/2 Litre, 4 Pass. Saloon. The complete set of 20 books below has just the 4 Rileys above.